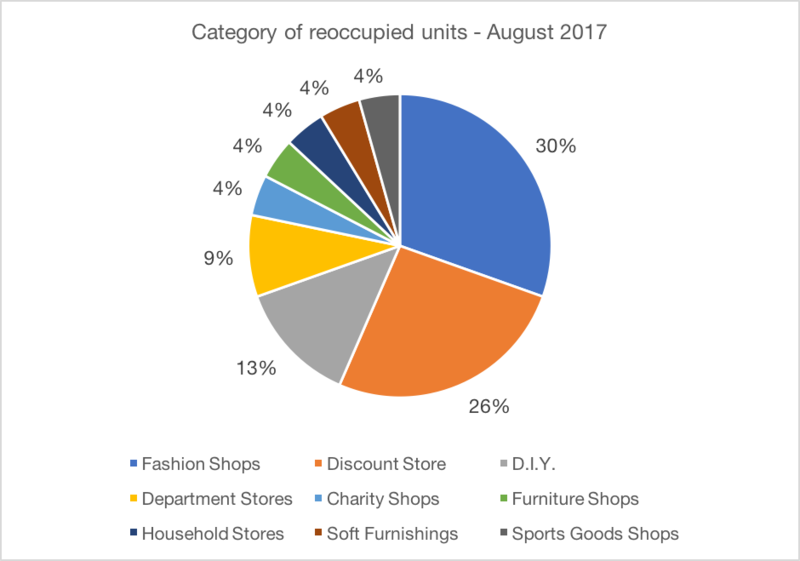 Of the 23 that have been reoccupied, Fashion shops (7 stores), Discount stores (6 stores) and DIY (3 stores) are the most common retail category of the new occupants. 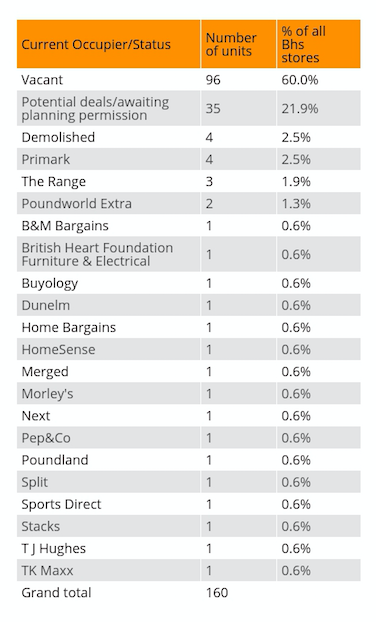 Primark have taken over the largest number of former BHS stores, with four currently trading. The next biggest occupier is The Range with three. Other occupiers to take over BHS units include Next, B&M Bargains, Pep&Co, Morley’s, Sports Direct, TK Maxx, TJ Hughes, Poundworld Extra, Buyology, Home Bargains and Dunelm. 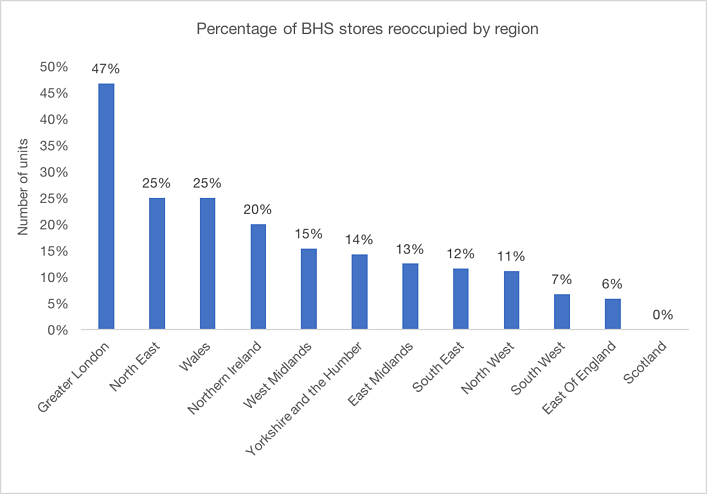 Towns outside of London that have seen their old BHS re-occupied include Hartlepool, Woking, Torquay, Solihull, Knaresborough, Bexleyheath, Basingstoke, St. Helens, Worthing, Kingston Upon Thames, Colchester, Harrow, Llandudno, Sunderland, Chesterfield, Redditch and Knaresborough. 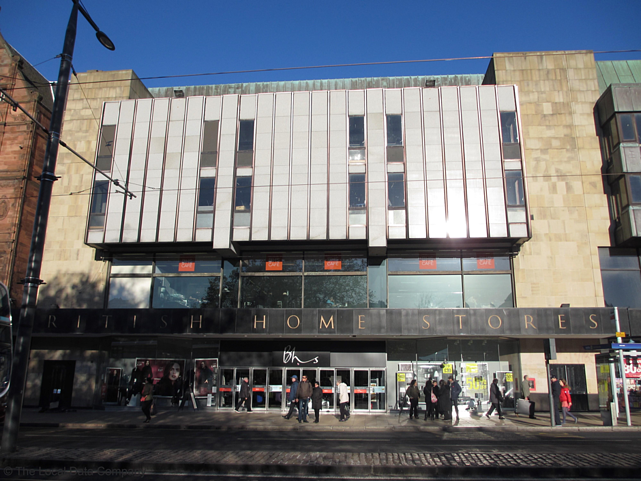 A number are applying for change of use including the Princes Street store in Edinburgh for conversion to a hotel, Taunton, where a gym will operate above a Poundworld and Glasgow where plans are in place to change the former store into a Cinema. The stores that have been reoccupied show significant regional variances with 47% of units taken up in Greater London compared to Scotland which has none. 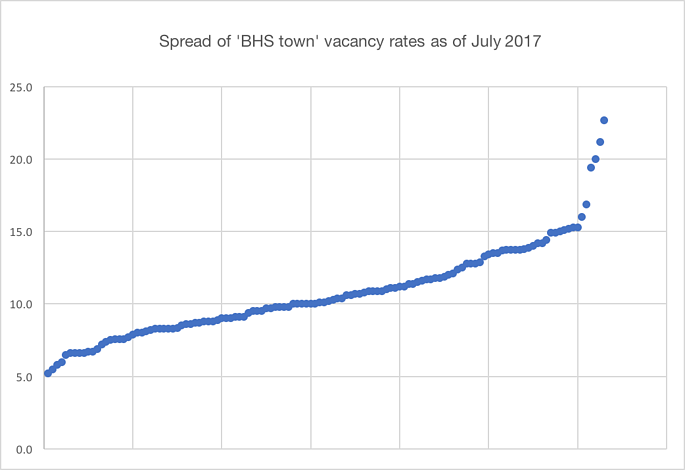 Analysis of BHS towns and their shop vacancy rates. The average vacancy rate of towns with an ex-BHS store is 10.2% which compares favourably to the national vacancy rate of 11.1%. The range however is wide, from St Albans at 5.2% to Ayr at 23%. “The reoccupation levels of old BHS stores are not surprising one year on. Firstly, many of these stores are large stores over multiple floors and after being occupied for many years, some have legacy issues such as asbestos to deal with. With large stores over multiple floors come large rents and rates bills along with a format that is not conducive to modern retailing without considerable cost to reconfigure the space. 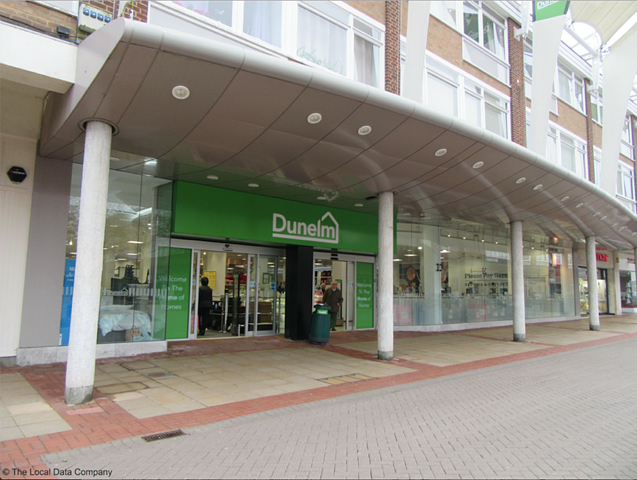 Many of the stores are in locations where the pitch has moved to another part of the town, to a shopping centre or in some cases a dominant retail park. The breadth of vacancy rates also illustrates the challenges that many of these towns face in seeking to occupy their shops.